Our courses for children begin when they are 2 years and a half old. 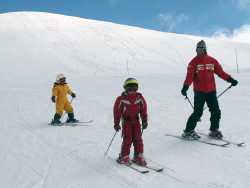 Our impassioned instructor will help your child to improve technically while learning the fun of skiing. 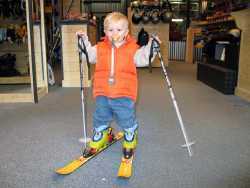 In a safe, calm and appropriate setting with lots of teaching equipment, your child will discover the magic of being on skis. Hemets, sun glasses, suncreen and appropriate clothing is highly recommended. Please do not hesitate to contact us with further questions. Limited to 4 kids per ski intructor. The ski instructor picks up and drops off your children at a spot designated to your convinience. The course is tailored to meet the desires, comfort level and needs of each individual student. White course : you have never skied before. Blue course : You can ski the blue runs without too much trouble and you are ready to improve on red runs. however to comfortably ski the black runs, you know you need some technique. 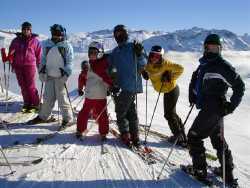 At this level, we will help you improve to the point that you can happily ski on all kind of snow and the bumps. Limited to 6 kids per ski instructor. In a safe and fun environment our instructor will help each student improve at their own pace. 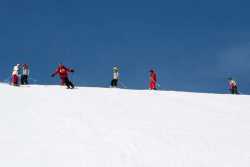 You would like to go to the snowpark. Limited to 6 teenagers per ski instructor. A maximum of 4 children will be with each professional. To run a 6 day course there must be at 2 children. However, if only 1 child sign up, we will offer you 3 private lessons instead of 6. It is cheaper to sign up for the above mentioned options than to enroll in a private lesson." A maximum of 6 children will be with each professional. To run a 6 day course there must be at 3 children. However, if only 2 children sign up, we will offer you 4 days instead of 6. And if only 1 child sign up, we will offer you a 2 days course.